I’ve been in a tower of my own making for as long as I can remember. I’m a very anxious person. As a little kid I was often afraid and overly cautious, and that only intensified as I grew up. The world is a scary place. Even though I don’t have magic hair that glows when I sing, there are still more than enough reasons to believe I can get hurt if I leave my tower. Often, it just feels safer to stay locked away—not leaving the house because something bad might happen, not letting anyone into my heart because they might hurt me, not going after something I want because I might not get it. You were told it was safer in your tower, but you knew better. You knew your life wasn’t going to begin until you got out. And your story proved that was true: Life begins when we leave our tower and chase our dreams. So thank you for having the courage to break out of your tower. Thank you for facing your fears, taking a leap of faith, and believing that your dream was worth the risk it was going to take to follow it. In the last few years, I’ve started leaving my tower more and more in order to really experience life and follow my dreams, and I’m not sure I would have been able to do that without thinking of you every time I got on a plane or wrote something deeply personal—two things that always make me want to run back to my tower when I first think about doing them. You don’t get enough credit for your determination, Rapunzel. You knew in your gut that something special was waiting for you outside your tower, and you didn’t stop until you lived your dream. And that journey of following your dream—no matter the anxieties beforehand or the obstacles you faced—led you to discover who you really are. Your determination to find your dream and live it speaks to me on a profound level, because I want to be that kind of person so badly. I want to be someone who lives her dream of bringing happiness and encouragement to a lot of people through my writing. I want to do whatever it takes to make that dream happen. And then I want to find a new dream to believe in just as intensely. That’s another part of your story that speaks to me: the fear of what happens when you catch the dream you’ve been chasing. Not a lot of stories talk about that, but I’m so thankful yours did. Because there’s such beauty in the idea that we don’t just get one big dream to chase for our whole life. If we’re brave and determined and make our dreams a reality, our life doesn’t end there. In fact, it begins a whole new chapter filled with new things to love and hope for. You found a new dream, and you became someone’s new dream. And that required a new level of bravery—the courage to break free of the tower we build around our heart. You lived both a romantic dream and a deeply personal dream about discovering who you are. And I’m grateful you were given the chance to live both—because both kinds of dreams matter. You chased your dreams with an open heart, and that open heart allowed you to see the beauty and the wonder in the world around you in a way I find incredibly inspiring. The world can be a scary place, but it can also be beautiful. 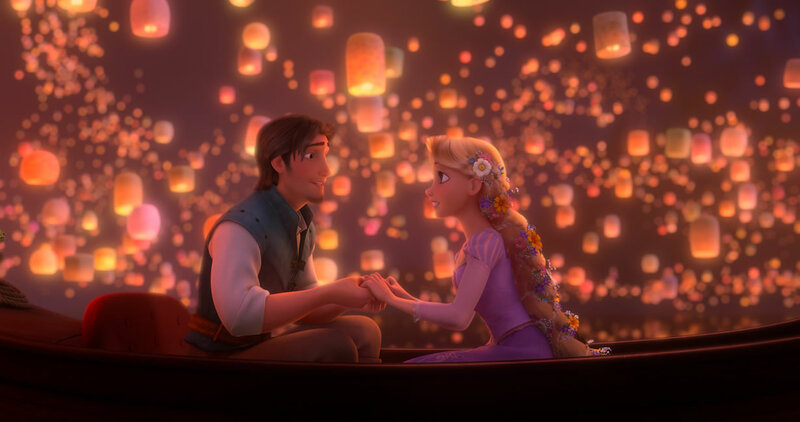 Thank you for reminding me of that every time I watch Tangled. When I watch you sing at the Snuggly Duckling or dance through Corona’s streets, I’m reminded that life is meant to be lived. Sometimes, I leave my tower but still find myself distracted by thoughts of all the things that could go wrong. So thank you for giving me an example of how to live in the joy of the moment. Thank you for reminding me that there are still things in this world to marvel at. And thank you for providing the perfect example of the kind of enthusiasm I never want to lose: a way of looking at the world with excitement—with open eyes and an open heart. When I think of how I want to see the world and how I want the world to see me, I think of you. I want to see the beauty in the smallest things; I want to see the reasons to leave my tower instead of the reasons to stay inside. And I want people to look at me and see a woman who’s following her dreams with infectious enthusiasm, a woman who is brave enough to step outside her comfort zone when she believes something is worth chasing and fighting for. As someone who’s finding the strength to leave her tower and live her dream, I thank you for getting out and living yours. You’ve given me a happy ending I can believe in, and that’s as magical as it gets. This entry was posted in Disney, Film, NGN Book News and tagged about me, disney, essays, film, letters, tangled by Katie. Bookmark the permalink. Like you, I saw Tangled as an adult. I love Tangled. Love. Tangled. Love Rapunzel. Love Flynn. Yes, I have the soundtrack. Yes, I know all the words. And yes, I might sing a little too loud. I feel like we really see PIxar’s influence on this one — the willingness to depict difficult themes, for instance. Rapunzel has a complicated relationship with Mother Gothel. (I had a Mother Gothel in my life — not my mother, thankfully.) That kind of toxic relationship is difficult to break free from — and we see her do that. I love the Rapunzel finds joy where she can and finds ways to create beauty in her tower. I love that she can take care of herself. (The scene when Flynn comes to the tower . . . She has a frying pan is not afraid to use it.) We see her confront her fears. We see her make friends as she goes. “You were my new dream” is one of the most romantic lines ever. (“I have a thing for brunettes” is also up there for me. Non-brunettes might not agree.I understand.) I love that we see both willing to sacrifice for each other. Love for Tangled. I am SO in the right place. Thank you for posting this today Katie it was just what I needed to read. I spend the entire work day believing it was better to put my walls up and not let myself really live or enjoy life because in the end I’d only be disappointed by people. But that’s not living that’s just existing and that’s not what we are here for. More often than not I go through the day clamping down my enthusiasm for what I care about and enjoy out of fear of judgement and it’s been a struggle for me to let go of the fact that if someone is going to make fun of me for it then that’s their problem not mine. What I really love about Tangled and what you wrote is that we are here to follow our dreams whatever they take the shape of and while we may make some stumbles along the way it doesn’t mean it’s foolish to go after them anyways. PS CONGRATS ON YOUR 600th article darling and once again thank you!!! i miss your mindy project review are going to do them for this season?